So far, I’ve written about some of the most well known parks in Delaware as they just so happened to be the ones we’ve visited most recently, but I think today’s post might be somewhere new for many people. We took advantage of the unseasonably warm weather to head down Route 9 to the St. Jones Reserve. We’ve been there before, but it’s been awhile and this is actually the perfect time of year to go because it can get REALLY buggy during the warmer months. If you are a stay at home parent or you are off work during the day sometime, this would be a great day trip because they have a visitor center that is open Monday through Friday from 8:00am-4:30pm with educational displays and fish tanks AND the Air Mobility Command Museum is right around the corner, so you can do both at the same time! We love boardwalks and there are plenty at St. Jones, in addition to trails alongside the nearby fields and wetlands and through the woods. Since most of the critters have gone in to hibernation already this year, we didn’t see much in the water other than lots of tiny fish but it is still fun to look. When there isn’t much wildlife to see outside, our focus turns toward plant life and that never disappoints. One of the coolest things to see on our hikes are the various ways in which vines have taken over other plants or trees. Sometimes the tree will continue growing and expanding, which makes it look like it is being strangled by the vine. This type of growth in plants is called thigmotropism. When the vine feels a support structure, it changes the way it grows so that cells on the side of the stem not touching the support elongate faster than the cells touching it, which allows it to wrap around and grow upward. Thigmotropism is a big word for kids to remember, but the general concept of a plant being able to feel and respond to its environment is definitely teachable. The next time you are in the woods, see how many different examples of thigmotropism you can find! 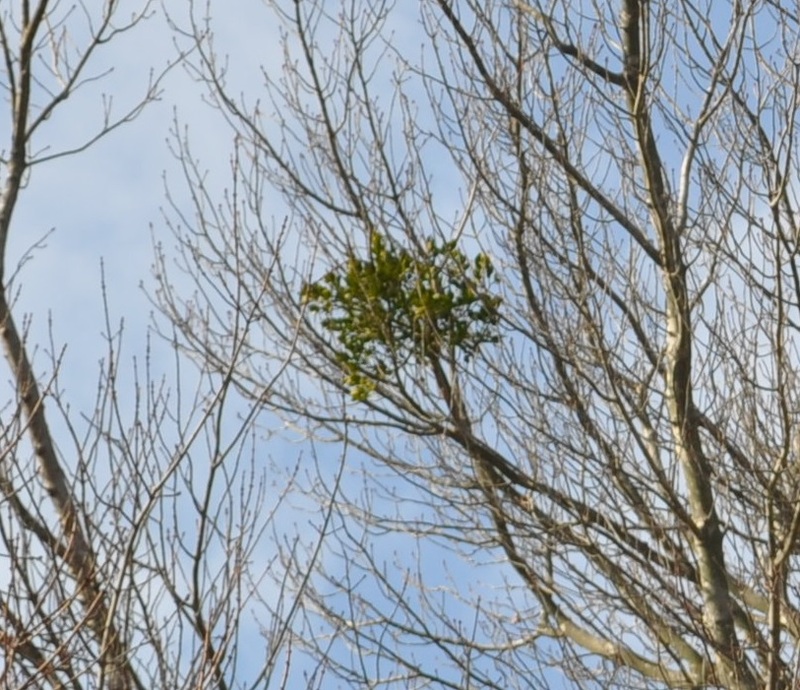 And since we are less than two weeks away from Christmas and focusing on plants, I thought this would be the perfect time to talk about mistletoe! You’ve undoubtedly seen it many times and may not have realized what it was. It’s all over the place, and like bird nests, you usually can’t see it when there are leaves on the trees. It grows wayyyyy up high, and I’ve found that in our area it prefers to grow in trees near water. I hate to ruin your perception of mistletoe, considering it’s traditionally associated with kissing but I have to tell you…it’s a parasite. Yep, you read that right. Mistletoe is a lazy, life sucking parasite. If it makes you feel any better, it is a hemi-parasite which means that it does photosynthesize a little bit to make its own food, but mostly it steals its water and nutrients from the trees it lives on. To keep you from getting too sad about this reality, you can rest assured knowing that it does serve a purpose in providing food and shelter for birds, mammals and insects. If you have some mistletoe hanging in your home for the holidays, make sure you keep it away from curious kiddos because it is toxic when ingested. We saw quite a bit of it while walking at St. Jones, but you might be able to spot some near where you live too. Since the trail at the reserve isn’t a loop, you will have to decide to turn around at some point so keep that in mind when deciding how far to go. We found a huge rock along the way that was very out of place so it left us wondering how it got there. See if you can find the same rock when you visit St. Jones Reserve!